There should always be healthy competition between manufacturers, because it keeps everyone on their best behavior and best quality control practices. Thank goodness we have two good options for feeding our baby critters! I have heard years back of many using it with success? 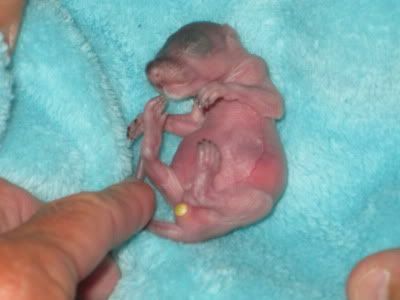 We have a 4 week oldish baby and am thinking of the FV as we just found him trapped... My daughter has a huge fox squirrel that she raised from a hairless baby that fell 40 feet out of a tree. She will be 2 in August... I think she used Esbilac. I'm just curious about almond milk? We are vegetarians and curious if a little will hurt them. Neither NC nor SC are legal states without a license...BE CAREFUL. I would order the Fox Valley as soon as possible. Nick is wonderful to work with -- he's the owner but he answers the phone 90% of the time. He will rush the order to you, if necessary. I have the same problem as you do -- I live on an island, even though I'm 15 miles from NY City! We have no Petco, no Walmart, and no veterinary clinic of any kind. Everything closes at 8:30pm. It's a challenge . Re: THE ESBILAC ISSUE/SC not legal? You have been sent my response. I would not feed another baby squirrel Esbilac, ever, and I would CERTAINLY not feed KMR. Here in Ontario the rehabbers feed pretty much everything Esbilac. They alright on Esbilac until around the time they started teething their bottom teeth. Then they all started to develop soft stools and finally diarrhea. I was on the phone to the rehabbers and our vet every other day for a week. The only thing they could advise me was to drop back to pedialyte and then slowly work my way back up to the full strength formula. I finally out of frustration decided to treat the bloating and gas...since that is something I recognize and can treat easily. I started giving them .25cc Ovol before each meal and in about 4 feedings their stools had returned to normal. I removed the Ovol and their stools started to soften after about 2 feedings...so I returned to Ovol and again back to normal. I have to call the vet and check to see what I can do about this. So I am being very careful to try to follow the recommendations given to me so my babies aren't taken away! But how long can I dose with Ovol safely? I know with rabbits it isn't an issue...but what about squirrels? Just wanted to put in a word about a succesful experience with red squirrels. 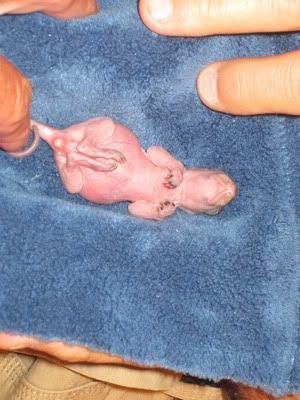 We raised 3 from about 2 weeks old and will release them in a couple more weeks. We live in Europe and no-one had ever heard of Esbilac so finally after rehydrating solution and one unsuccesful formula for puppies settled on the puppy milk made by Royal Canine. Since then the squirrels have thrived. They are alert, healthy, shiny coats (especially since I started adding whipping cream and full cream yoghourt) and extremely active. It was easy to introduce fruit and veg, as well as some rodents pellets, and especially love the pine cones and bark, drinking water well as soon as we started to wean them. Will be very sad to see them go but hope to see them around in the garden. Extremely resilient little things too as we had no choice but to take them on holiday with us in the car. ( I do not recommend this unless they are still very small and not yet moving about, one also has to be extremely organized and have a very patient husband! ) We set ourselves up on the beach with a tent, warming bottles and devised a way of heating up their milk which worked very well. There was really no-one I could leave them with and so were able to continue their 3 and 4 hour feeds without disrupting our holiday. We arrived back home just as they started exploring their environment and made them a bigger cage which they love. I have always been told NEVER to feed kitten formula (or milk) to a baby squirrel... these two liquids are said to be a big no no as they can make a squirrel very ill and/or even kill them..... thats all I know on the subject of KMR. Now as far a Esbilac goes, I personally have never had any problems with feeding it to my squirrels. I generally only have one squirrel at a time and mix each feeding as needed (the powder is never premixed). What Fox Valley formula should I use as she grows into adulthood? ... is your Squirrel still drinking formula? - I ask as most Squirrels will wean themselves around 3 to 4 months old. thats all I know on the subject of KMR. Now as far a Esbilac goes, I personally have never had any problems with feeding it to my squirrels. I generally only have one squirrel at a time and mix each feeding as needed (the powder is never premixed). I NO LONGER USE or RECOMMENDED THE USE of ESBILAC for SQUIRRELS!! Mixture..... and have now changed over to FOX VALLEY. place for bacteria to grow – and infections to develop. Last edited by Administration; 08-16-2011 at 06:25 PM. Sounds very similar to what I had last year. I was given a baby that was fed Esbilac and he came to me bloated and impacted. I never posted the photos, but it seems this is the right time. I wasn't 100% sure at the time that this was from the Esbilac, but now I am. I transitioned him to FV and he did beautifully. When I removed the "impacted stuff" it was like concrete, and had the same color...whitish/grey. He would get impacted as soon as I removed what was already there, and I would start again, until it was out of his system. The day I got him. This was about a half hour after getting all of that crap out of his system. I would start the procedure again, and then again until it all finally came out. 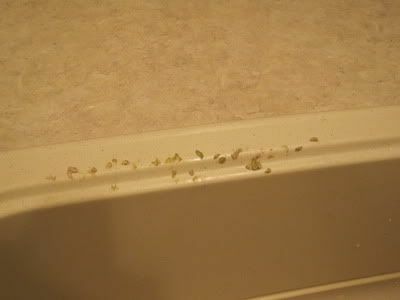 This is what came out the first time....poor baby! This truly does open up a whole new can of worms regarding the use of Esbilac for squirrels. I say it's just one big, unequivocal NO NO ...DO NOT USE IT. When my Fox Valley shipment arrives how do I go about switching over from Esbilac? i have used esbilac in the past with no really bad experiences. You can love them, raise them and let them go.....after that, they are in mother nature's care...........Welcome to the nut house! Home to Leroy & Lisa ... ...some just know they have it good I guess!